Sports Costs > How Much Does a Bobsled Cost? How Much Does a Bobsled Cost? A bobsled is a sled that is used in the sport of bobsledding. Also known as bobsleighing, bobsledding is one of the most famous winter sports. This sport is done in pairs or in groups of four using a large, gravity-powered bobsled, which will go downhill following a pre-made track. An Olympic-sized bobsled can cost at least $30,000, but this price can be higher as the design becomes more complex. 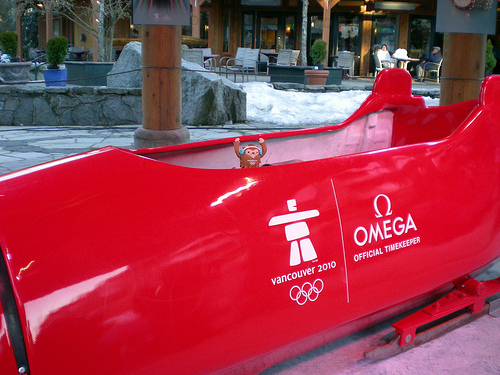 In fact, it was reported that the US Olympic team’s bobsleds during the 2010 Olympic Games was priced around $50,000. However, other sites stated that prices can go higher depending on the structure and material of the sled. Other sleds, which are not really used for Olympic races, can be much cheaper. If you are just starting out or are looking for your first bobsled, then you should be prepared to spend anywhere from $1,500 to $5,000. On TeamUSA.org, there were a handful of bobsled listings, ranging anywhere from $600 to more than $4,000. Granted, these were prices for slightly used or reconditioned sleds. If you just want to experience the adrenaline rush with bobsledding without buying your own expensive equipment, then you may be able to go to a ski resort and experience bobsled rides if they offer this sort of option. In Park City, Utah, they offer bobsled rides for $175 per person, while Lake Placid, another popular destination, offers rides for $95 per person. Of course, you cannot go bobsledding without wearing protective gear. Thus, you should set aside a portion of your budget for buying a helmet and other safety gear. Plan on budgeting, at a minimum, around $100 to $250 for just basic gear. Like any other vehicle, maintenance is an important factor to consider. For example, you will have to polish it before use for better performance. This is especially true if you are riding for competition. If you want to learn the sport of bobsledding at a competitive level, you may want to find a person or ski resort that can offer bobsledding lessons. Unfortunately, you cannot just take your bobsled anywhere to ride it. You will need to have a course to run, and these courses may have fees in order for you to use it. If you enter into any type of competition, you will most likely have to pay an entry fee. If you own a bobsled, you are going to need to transport it in order to use it, and this will usually require a trailer of some kind. There is a danger in bobsledding. Always wear the appropriate safety equipment, including a crash helmet, whenever engaged in the sport. Injuries and even fatalities can occur since it is a very fast-moving sport. If possible, try consulting with an experienced sledder before learning the sport. If you only want to do bobsleighing for fun (and not for professional competition), consider renting a bobsled rather than buy one. You could also just go to a ski resort that offers rides.